The Douglas Farmers Market takes place at the General Store on Saturdays in summer and early fall. During a visit in 2013 I spotted an usual imprinted item—unusual until I thought about it in-context. It's the dish towel pictured below, which was being sold for $8, with all of the proceeds going to support the Douglas Farmers Market. 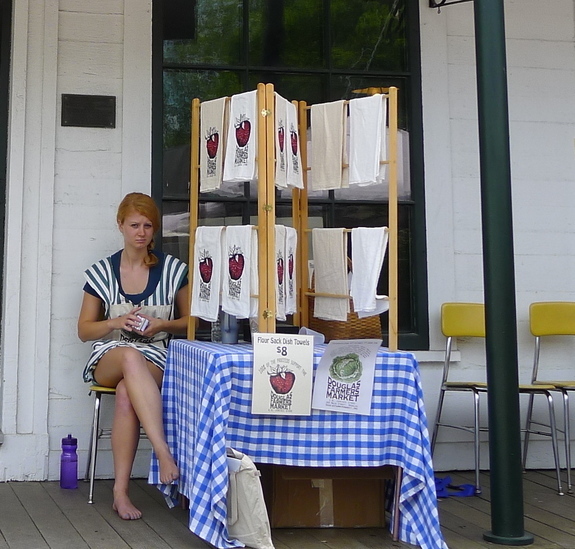 It made perfect sense: A dish towel, for sale at a farmers market, held at a general store. Who can't use another dish towel? And what a sharp logo. Notice the flyer and the sign, too. As I understood it, a really good graphic designer had moved into town and gotten involved with this community effort.